The Nissan Ultimate Work Titan gears up for an unveiling at Work Truck Show in Indianapolis, Indiana, before a future career of doing charitable work helping Habitat for Humanity. The company calls the creation a "home builder’s dream." 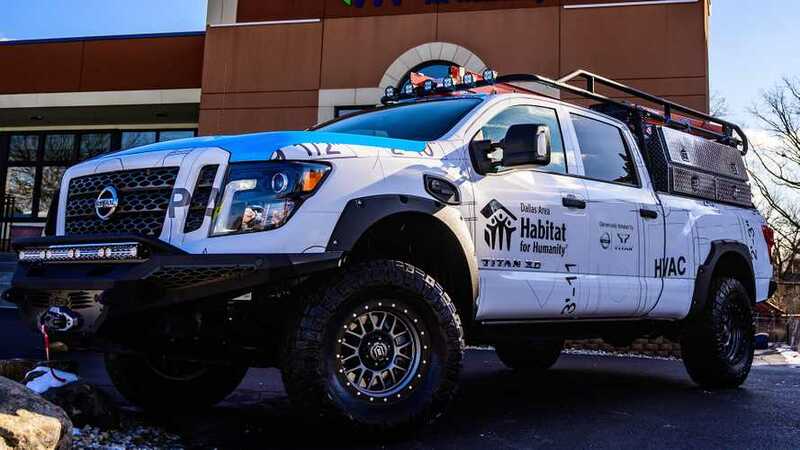 Before building the Ultimate Work Titan, Nissan consulted with contractors and Habitat for Humanity volunteers to figure out what they needed. The three major requests were having off-road capability, a mobile office inside, and a high-capacity bed, including room for carrying ladders and lockable storage. The Nissan Ultimate Work Titan starts as the Titan XD Diesel Crew Cab Midnight Edition but with lots of extra features so that volunteers have an easier time building homes for folks in need. The pickup now rides on a three-inch suspension lift, adjustable-height coilovers, custom rod end bearings, and Delta Joint upper control arms. Nitto Ridge Grappler tires cover the multi-spoke wheels. The truck wears Addictive Desert Designs bumpers, including a Warn winch at the front. The tubular roof rack has LED projectors pointing forward and offers space to mount longer items, like a ladder. Lockable toolboxes are also along the rear sides of the pickup to keep equipment secure. Inside, there's a mobile office for coordinating the work. The space includes a 13-inch laptop, printer, desk, file storage area, and power inverter. The new custom Titan is a followup to the Nissan Ultimate Service Titan for the Red Cross that features a complete command center in the back, complete with a small kitchenette, sleeping area, and workspace. In addition, Nissan is building one more of these philanthropic pickups to create a trio of hard-working rigs for charity. INDIANAPOLIS (March 5, 2019) – Nissan is no stranger to Habitat for Humanity, having donated more than 150 trucks and $16.9 million since 2005. Today in Indianapolis, the 14- year partnership reached new heights with the unveiling of the Ultimate Work TITAN, the second in a series of three Ultimate TITANs built as part of the purpose-driven Calling All TITANs campaign. Featuring a complete mobile office, toolkit and off-road necessities, the one-of-a-kind work vehicle debuted to a group of media at the headquarters of Habitat for Humanity of Greater Indianapolis. The truck will be on display at The Work Truck Show at the Indiana Convention Center through March 8, and then officially donated to Habitat for Humanity, where it will be put to work on and off the job site. And with that, the build of the Ultimate Work TITAN commenced. Originating as a stock TITAN XD Diesel Crew Cab Midnight Edition, transformation into the Ultimate Work TITAN began just as the Ultimate Service TITAN did – with the addition of a factory-authorized ICON three-inch suspension lift kit, available through Nissan dealers. The ICON lift kit includes adjustable-height coil-over shock absorbers, custom rod end bearings and patent-pending Delta Joints – helping provide increased ground clearance and enhanced ride quality both on and off the job site. Anchored by Nitto Ridge Grappler tires and ICON Alloys REBOUND wheels, the truck adds Addictive Desert Designs bumpers to provide an additional layer of protection, while a WARN Industries ZEON Platinum 12-S Winch ensures the Ultimate Work TITAN can help itself and counterparts out of even the most challenging situations. In the nighttime hours, Baja Designs lighting leads the way with custom worksite lighting. In the midst of the chaos of a work site, often times what construction site supervisors need most is a quiet space to relax and get some paperwork or calls completed. The Ultimate Work TITAN has this covered, and then some. Knowing that supervisors are constantly in need of updated build site maps, blueprints, punch lists, daily reports and submittals – among a daily list of paperwork – a 13-inch laptop and a printer was added to help make life just a little bit easier. And not be overlooked in the back seat is a full mobile office, featuring a custom desk and file storage with an additional power inverter. When it’s time to get out of the mobile office and into the work site, the Ultimate Work TITAN bed is a great place to start. Anchored to TITAN's innovative Utili-track® Bed Channel System, a BEDSLIDE 2000 HEAVY DUTY sets the stage for easy access to all the bed has to offer. Connected to the bed slide is a DECKED lockable storage system, where a site supervisor can confidently store tools. Commercial class heavy duty lockable tool boxes are included along the sides of the bed for additional storage. Inside the lockable storage are some of the highest quality tools in the industry. In addition to a complete toolkit, other products stored within the bed include a table saw, chop saw, chainsaw, air compressor and drill kit. A Zamp 200 Watt power inverter, as well as RIGID Extension Cords, was included to provide power sources in addition to the 110-volt power outlet included both in the bed and the cabin of the TITAN XD. Of course, no home can be built without a ladder. 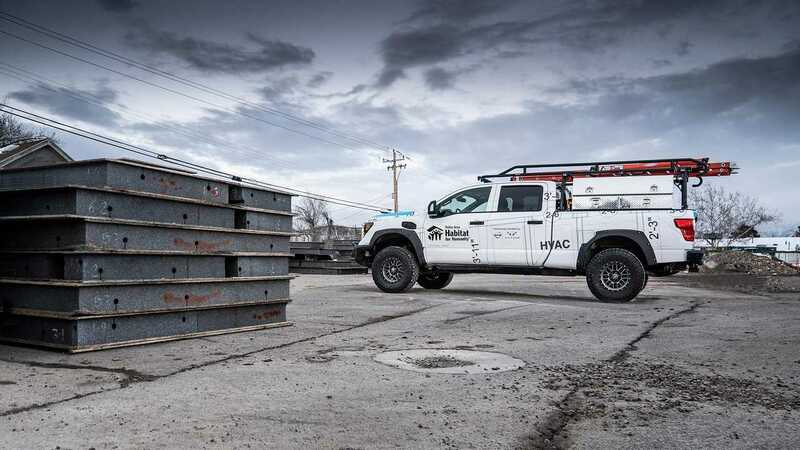 Atop the Ultimate Work TITAN sits a TrailFX aluminum ladder rack featuring multiple commercial grade ladders, easily accessible with the help of the TITAN XD bed step and dampened assist tailgate. Meanwhile, TITAN XD’s 14 cup holders will ensure everyone has a spot during their hard- earned water break. And at the end of another long day at the job site, builders will rest easy on the standard TITAN XD Zero Gravity seats, enjoying music on the new Fender® Premium Audio System, reflecting on a job well done. The Ultimate Work TITAN will be on display during the Work Truck Show at the Indiana Convention Center through March 8. For more information on the Calling All TITANs campaign, the 2019 TITAN, TITAN XD and the complete Nissan vehicle lineup, please visit NissanNews.com. empower. To learn more, visit habitat.org.